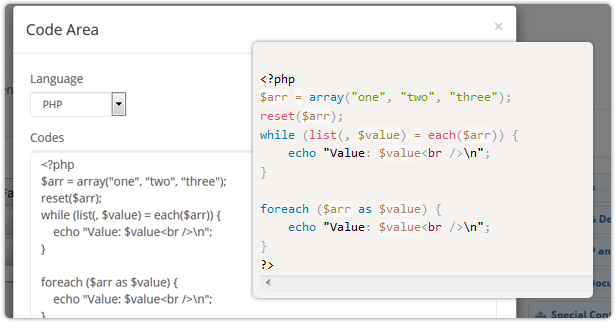 documentSide is a PHP based document generator. Its provides all the tools necessary to write complete guides, manuals, documentations and eBooks in a user-friendly and very easy to use environment. documentSide can generate, Web / Local HTML files, printable PDF documents and downloadable ZIPs for e-mail attachments or software documentations. documentSide offers to you advanced tools for document sharing. Registered user controls, Author-specific contents, Password or Licence Key requirement, shorten document links supported bit.ly etc.. There too many features available for document creation! 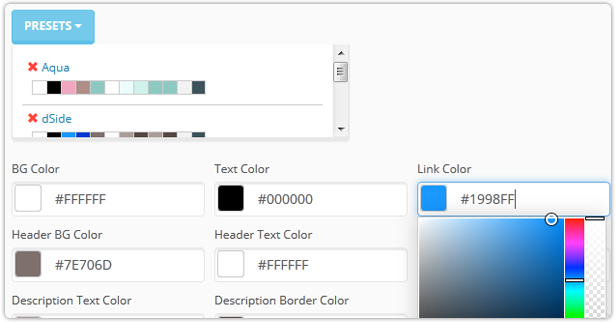 documentSide offers you the option of customizable colors and layouts! 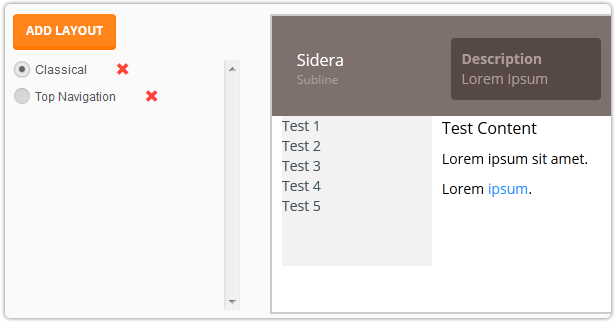 You can easily design your new/existing documents with Layout options. Pre-defined area colours easily can modify with color picker also you can save as a preset your color sets for other documents! Also you can use your own CSS file! Yes! Your Documents Must Be Creative as Your Projects! documentSide will come with two layout option, but that is not mean it is has limited layouts! You can easily create your own Layouts, it’s little a bit HTML experience required it’s not that hard with Bootstrap 3.2 support. Bootstrap core files automatically included to your documents. Who Say The Programmers Doesn’t Understand the Intricacies of the Art! Syntax Highlighting is a “Flame of Anor” for programmers! In fact, we’re using it. 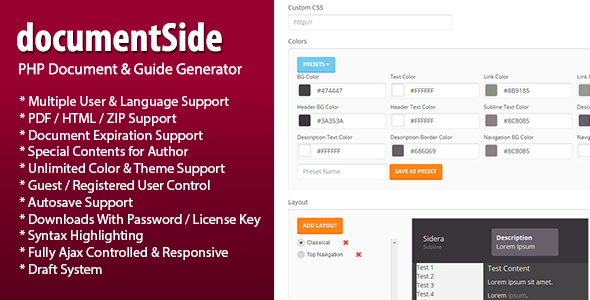 documentSide gives you to stylish programming codes ability. 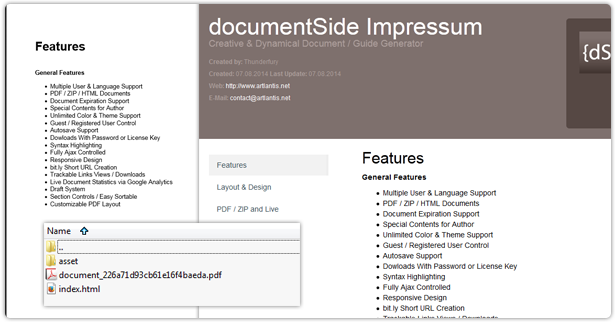 documentSide uses customizable PDF layout as a template located documentSide folder. 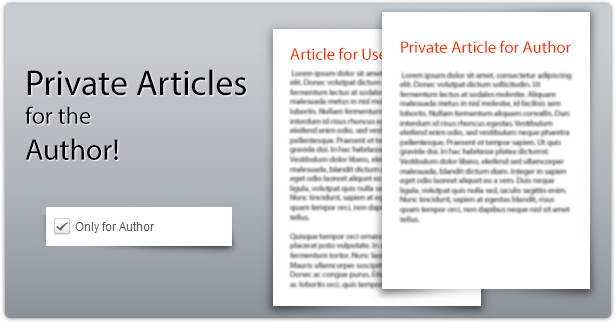 You can easily modify current PDF layout or create new ones. Yes, PDF documents supported HTML and CSS, all the rest is your imagination! documentSide will store your datas on different file types. Also there a few share options available! Basically all documents saved on documentSide database until you publish your documents. Its will create/update documents PDF, HTML and downloadable ZIP file. 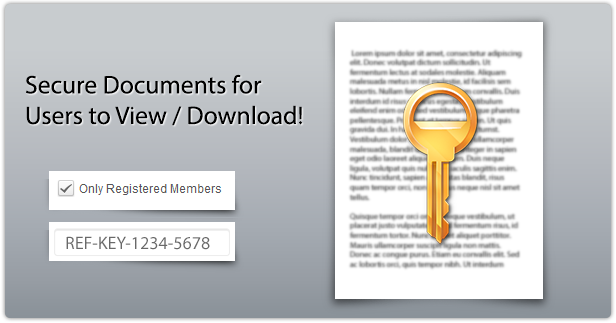 You can easily share your documents as Live view, PDF view or downloadable links. Also if you have a bit.ly account, documentSide will create your shorten links by bit.ly API. In addition, if you have special contents for your project and you don’t want to share on your document you no need to create new document for that. documentSide will do it for you! Documents for registered users? Documents for key / password required? If you have a membership system you can easily give an access to your users for view/download your documents. Also if you write a program and its has a document for usage, you can define a password or license key for who enter key to allow see your documents. If you have special contents for your project and you don’t want to share on your document you no need to create new document for that. documentSide will do it for you! For example; If you are a programmer and you have a few programs, we know you are best! You already created installation, usage, customization documents/guides etc. But all of them for your end users and this documents will do their own job. But after a few years.. You’ll want to remember some things, small intricacies of the software you write. 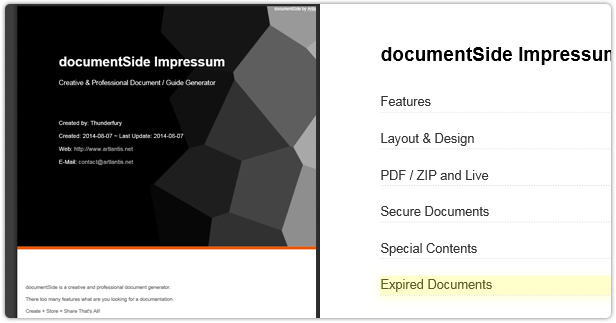 documentSide has a expiration date controller for special documents. 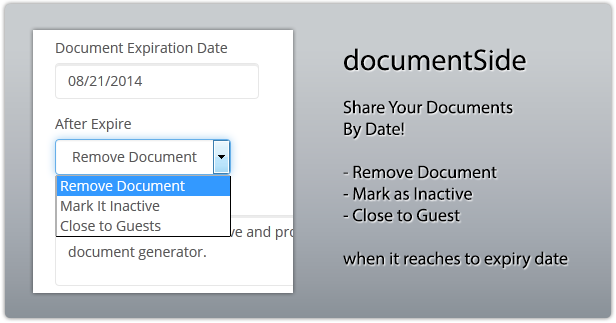 If you would like to share a document with specific dates, documentSide can check dates for you and when date come to your defined expiration date it can run an action as you selected. There 3 action available for this option. This entry was posted in Uncategorized and tagged article, database, document, documentation, download, feeds, forms, generator, guide, help, manager, manual, media, pdf, php, scripts, sliders, software, support by Acty. Bookmark the permalink.